If you get into really remote areas like the Central Kalahari Game Reserve in Botswana, Kaokoland in Namibia or Lake Turkana in Kenya, you might have to supply your own water for drinking, cooking and washing for days. An adult should normally drink four to six litres of water or other fluids per day (including that in food) but high temperatures may double this requirement. You must remember to drink more on hot days, even if you don’t feel thirsty, as to prevent heat exhaustion. If you have to supply your own water for drinking, cooking and washing you should provision at least 10 litres of water per person per day. Multiply the number of people with the number of days and it adds up to a large amount of water! It is also good practice to carry at least 20 litres of drinking water with you at all times, as a safety measure in case your vehicle breaks down. Carrying and storing water on an overland trip is not easy. Fitting a water tank to your vehicle will make life a lot easier and enable you to carry more water for longer distances before replenishment stops. However, you will have to constantly gage your stock and fill up where ever you can get clean water. Remember to always treat the water when you fill up your tank, even if it comes from a clean natural source otherwise it can go green and taste distinctly algal. 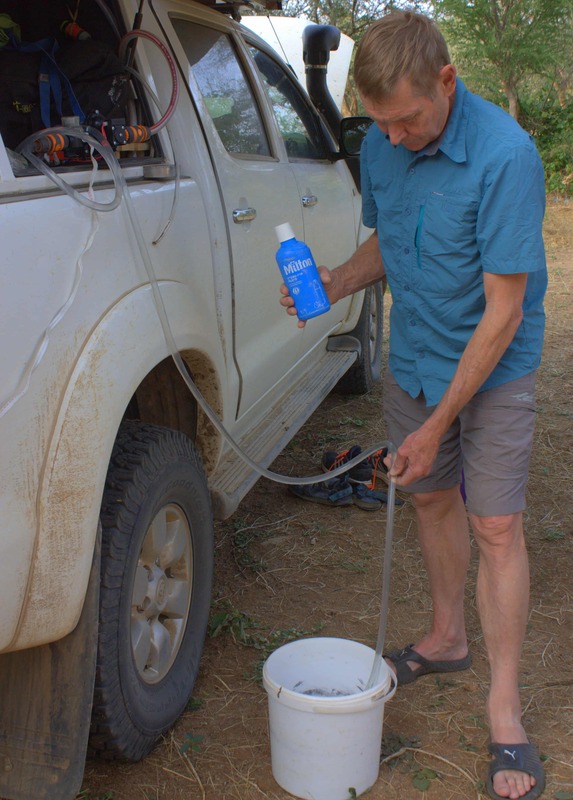 During our eight month trip from Cape Town to Ethiopia we added a cap full of Milton (a chlorine solution) to each of our two 70 litre water tanks to keep the water clean and then let the water stand for 30 minutes to permit the purifiers to take effect. Filling up the water tank from a bucket, using a little electrical pump. If you only have one tank, you can buy bottled water to keep your drinking water separate from your washing water. However, it can be problematic to protect them from damage. If you intend doing a lot of off-road driving, take care to buy bottles made of thicker plastic. Irrespective of whether you have a water tank fitted or not, you should always carry a container with spare water with you as your tank may spring a leak at any time. Also, the bottles that you bought can break on rough roads. A good idea is to permanently keep a jerry can or two with water on your roof rack in case of emergency but remember to refresh the contents every now and then. If there are local people or game to be found in an area they will give you clues regarding water sources. As you drive, keep an eye open for boreholes, streams or dams that you may pass. 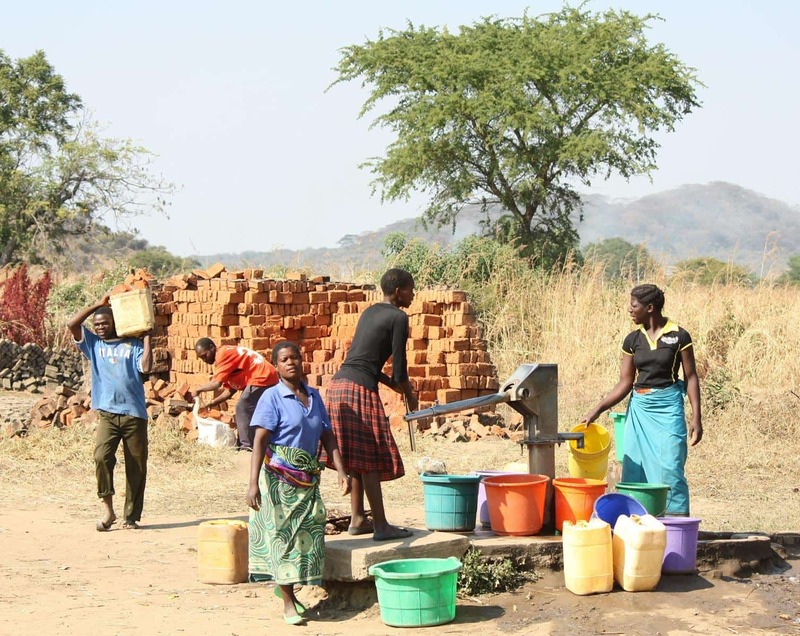 A borehole providing water to the community in Malawi. A pump is helpful in transferring water into your tank, but unless you are truly desperate never pump in cloudy water. Not only will the sediment settle to the bottom of your tank, which may then prove difficult to clean, but the particulate matter in water makes it far more difficult to disinfect and make safe for drinking. Rather let cloudy water settle overnight in another container, before putting it in the tank and treating it. Often, however, you will see a clear stream flowing by the road and this makes for an enjoyable water foraging experience. Take note however of how empty your tank is, so that you know how much disinfectant to add. Should you not know how much water you have put in, then you will probably feel you have to ‘overdose’ the tank, which will affect the taste of the water. 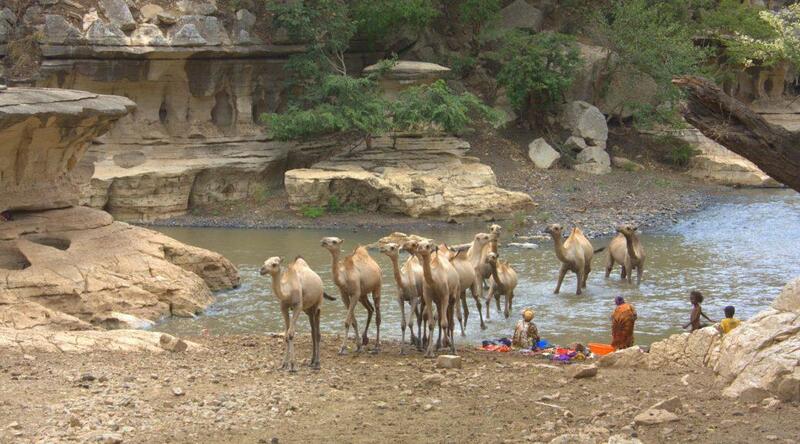 Sometimes you are lucky enough to find a source with crystal clear water, like this one in Ethiopia. Unless you buy sealed, bottled water you should always treat your water before drinking or washing your dishes with it. Treat non-bottled water with chlorine, iodine or silver based purifiers, or boil it. A solution of 10 drops of unscented bleach per 1 ℓ water can be used to wash dishes and rinse all vegetables and/or fruit that will be consumed raw. Improper hygiene of food and water can lead to traveller’s diarrhea. Many of the bacteria that cause diarrhea can be destroyed by cooking the food or boiling the water. If you prepare your own food while you travel and take care with the water you drink, you limit the risk of diarrhea substantially. In Africa you often get the best quality, best priced and freshest fruit and vegetables from street vendors or open-air markets. Make sure, however, that you wash or cook these properly. 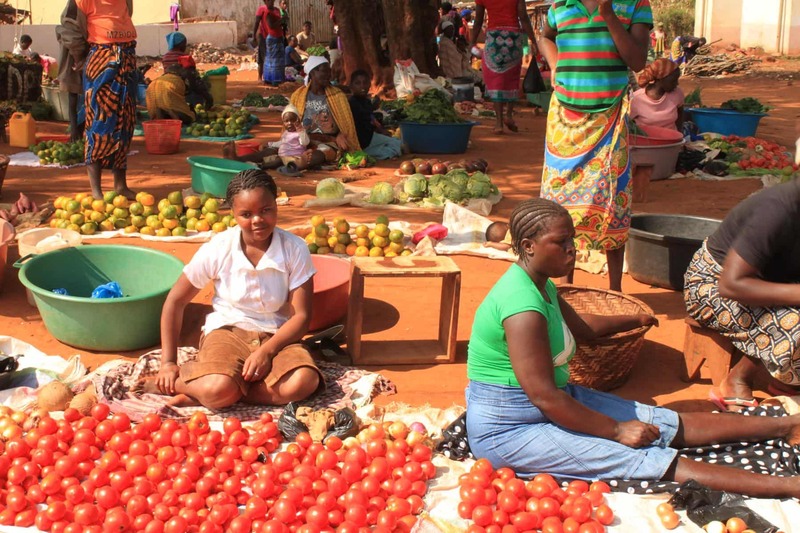 Often open-air markets provide the best quality fruit and vegetables far cheaper than supermarkets. In rural Africa most people get their drinking water from boreholes, which are usually safe for consumption. If you are not sure of the source of the water, you have to take extra care. 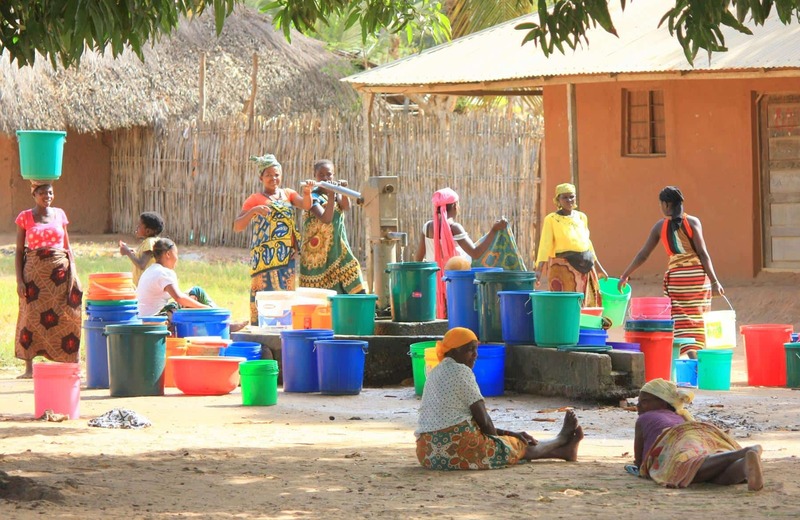 Women in Malawi filling up their buckets from the communal borehole. Cholera is primarily transmitted through ingestion of water contaminated with faeces or vomit of infected people or, to a lesser extent, faeces of carriers of the disease. The disease is often associated with flooding, poor water supplies and/or poor sanitation. 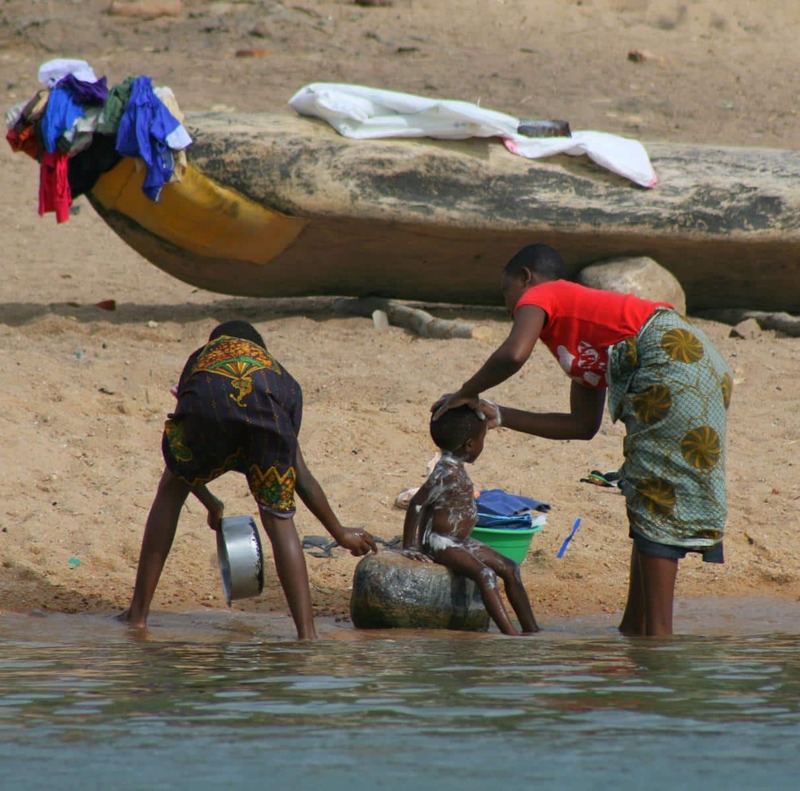 The people living at Cape Maclear use the water of Lake Malawi for drinking as well as washing bodies, dishes and laundry. If you have reason to be concerned about the water and won’t be able to carry or buy bottled water, you can get a preventative oral vaccine from your medical practitioner. This will be effective for six months to two years. But it is best is to treat all water, apart from that from impeccable sources. Cholera is caused by bacteria and will usually cause profuse watery stools and vomiting. Rapid dehydration may follow which may lead to the patient’s death within a few hours. At the end of a long drought in Botswana the only water in a huge area was in Tshinga pan. We strained out the dung though a dish cloth into a 20l plastic can with a tap at the bottom; poured Floccotan into the chocolate coloured water; shook it and let it settle. Next morning opened tap to drain off muck. We boiled the crystal clear sweet tasting water to dink. This was when the earth was still young – what to use now? What I do to clean my water tank is the following. At the end of my trip I add an amount of – say – 300 ml of chlorine to the remaining water in my watertank and drive one day with it. Then I let it run off completely and keep the tank well ventilated. At the next trip I is clean and ready. The most important resource on any trip! Even a local weekend trip can become uncomfortable if you don’t carry water. I used to buy additional water in the 5l plastic containers but find that in recent times these are made of very thin plastic and they are prone to breakage. So I carry a clear plastic container that can we filled from these or other sources in addition to the build in tank. What I really dislike about the build in tank is that without a gauge you never know how much water you have left and it is not easy to clean once contaminated.